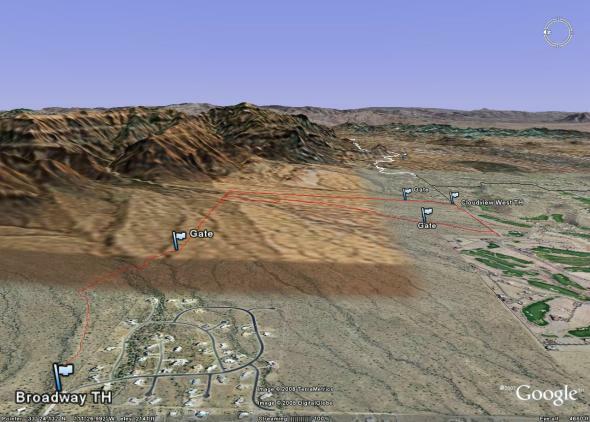 I continued my exploration of the Lost Goldmine trail this morning by completing the West segment from the Broadway trailhead to the Cloudview west trailhead. It was a fun segment of trail, but itâ€™s not your fast and flowie singletrack that lets you soak in your surroundings. I only looked up to the Supeâ€™s when I stopped for a breathers. All my concentration was on the gradual tech climb or the bouncy tech decent. If you want to hone your slow moving balance tech skills, Lost Goldmine West is the place. A 29er would surely smooth this trail out enough to give it a higher grin factor. * Technical feast of rock gardens. Peas, potatoes, tomatoes, melons and cholla. * A mini mini mini Milagrosa â€“ half the tech, none of the decent and a quarter of the fun. * The rocky part of the Long Loop at McDowell on steroids. * The east leg of Lost Goldmine is solid gold. The west leg is solid rock. I was short on time when I ended up at Cloudview so I headed off and explored a jeep road back up to the big wash. I made up a little time, but even the jeep road was techy in spots. The west was very fun, just not an everyday kind of ride for me. Iâ€™ll be back to ride the west leg again as a connector from the East Leg to Jacobâ€™s Crosscut. Other than that, my tires will be true to the east side where the trail is golden. Saturday morning, May 9, 2009. we staged at the Broadway road entrance to The Jacobs Crosscut Trail. This trail is extremely rocky, The first mile or so is basically jagged, loose, 4 to 6 in gravel. It’s very challenging to hold a line and stay out of the cactus (plan accordingly, tweezers and spare tubes are a must). 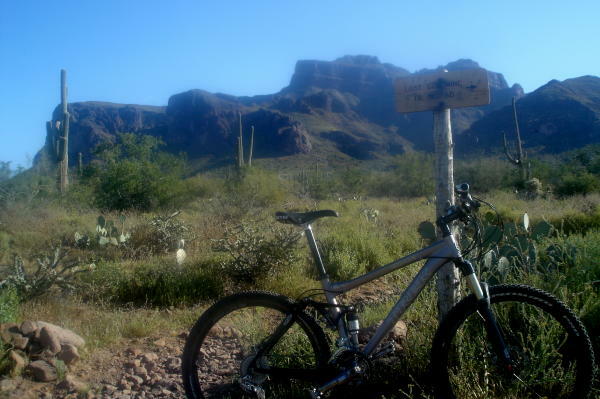 We rode the trail over to Lost Dutchman State Park. 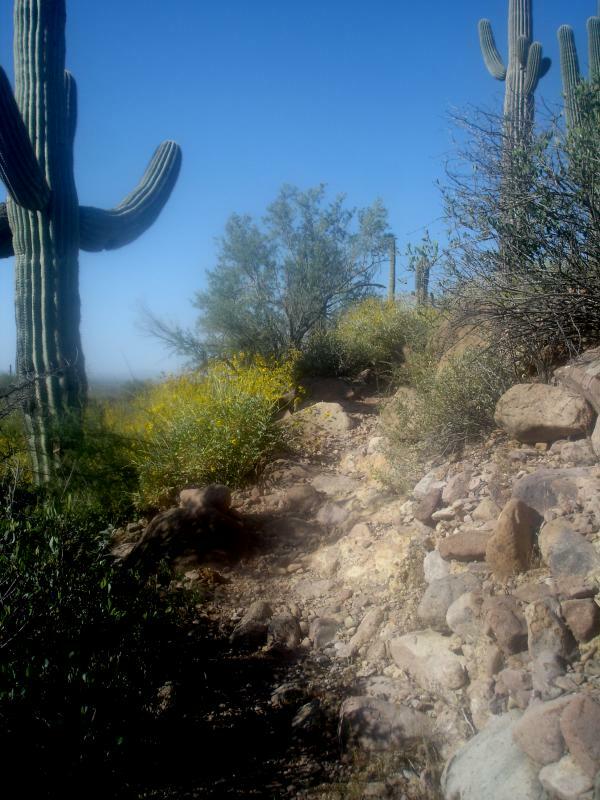 The trail has a lot of fun areas, there are no major lung burner climbs, just lots of opportunities to pick through rock gardens and dense (skin tearing) brush). Once you get near the park, the trail gets pretty easy (maybe too easy). It was about 11 miles out and back to the Broadway trail head. I would do this trail again, but will go to some trouble to avoid the really rocky stretch if possible.